The weekly photo challenge is a different photo assignment from dailypost. This week is near and far, two-dimensional images with a three-dimensional feel. Low point-of-view and converging diagonal lines are two ways to accomplish this, another approach is get some high elevation. To increase the effect foreground objects or size perspective give depth. 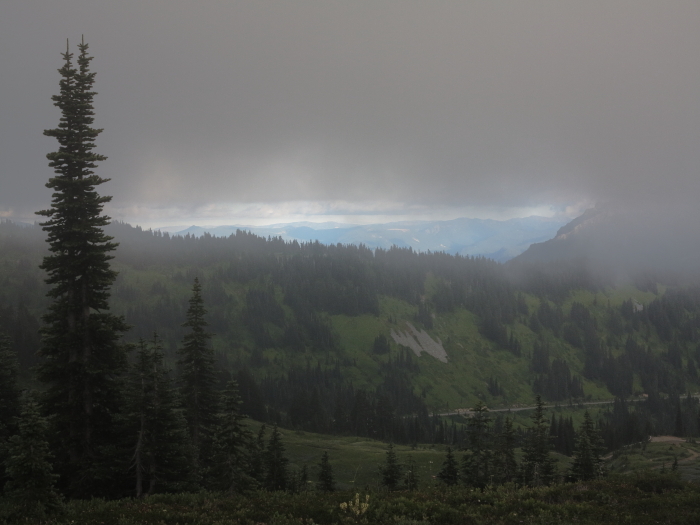 My image comes from a very overcast day on Mt. Rainier in Washington. Not only does the ominous hanging cloud provide more of a foreground it creates an extra horizon line and a tunnel for the eye, directing it towards the hundreds of miles of rolling foothills.